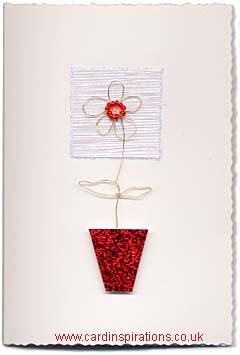 A white deckle edge card is decorated with a flower made from gold wire and red beads. The flower stands in a pot of red hologram paper and is backed with a square of satin pearl card. Cut a square of satin card and mount it on the front of the greeting card using the illustration as a guide. Pick out the outline of the square in clear glitter glue. Bend the gold wire to the flower shape using the detail illustration as a guide. 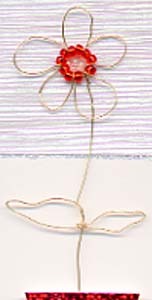 A loop of wire in the center of the petals is threaded with red beads. Stick a piece of red hologram paper on some thin card and cut to the flowerpot shape. Put sticky fixers on the back of the flowerpot to raise it from the surface of the card. Glue the flower head in the center of the satin card square with glitter glue. Add extra glitter glue to the center of the flower head. Mount the flowerpot on the greeting card at the same time trapping the bottom of the stem under the sticky fixers. Wiggly wire flower card made by Trish Caudle. Wiggly wire flower card photographs are reproduced here by kind permission of the copyright owner Trish Caudle and may not be reproduced elsewhere without permission.